Two of my dear friends recently gave birth to babies. Thanks to the technology of Facebook and Google Chat, I knew of each labor as it began. I waited impatiently for updates over the hours. 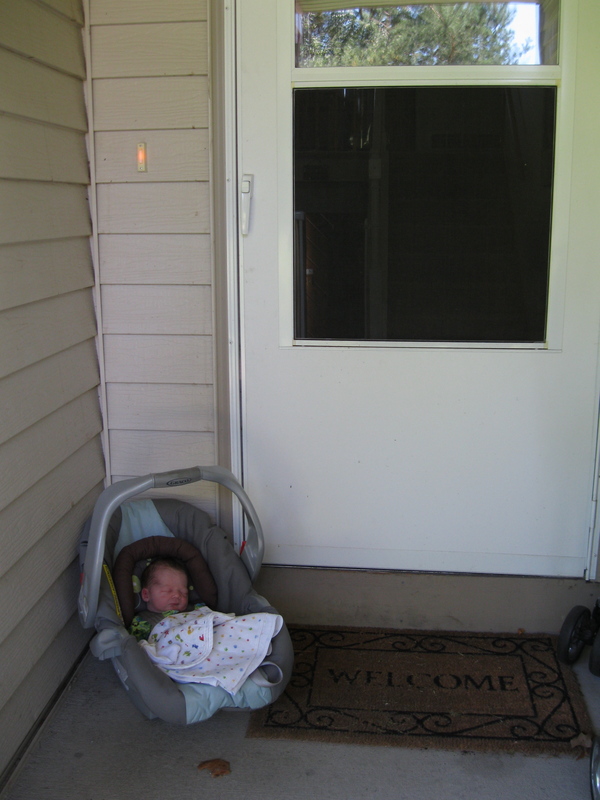 I rejoiced with a loud whoop when I read that baby had made a safe entrance to this side of life. And as I “attended” each birth virtually, sending my friend good thoughts and prayers and strength, I would remark with a laugh that childbirth was much more fun from far away. When I was not the one moaning over the birthing ball or counting through the contractions, labor seemed fast and furiously exciting. I knew the baby would come soon and I trusted the baby would come safely – both things I doubted when it was my turn. Distance and perspective give such gifts. But I know that if and when my time comes to labor again, proximity will erase all such surety from my mind. Outside the delivery room door, childbirth is concept. Behind closed doors it becomes reality of blood, sweat and tears. Time slows down; anxiety ramps up. Hidden away from the bustling everyday world, women push beyond the limits of their being. They give more than they thought possible. They do that which they doubt they can do. It is the only way life can continue. And whether the labor takes place under a hospital’s bright lights or in the comfort of one’s own home, it is a liminal experience – a place between life and death, a space outside of normal time, a passage from one side to the other. But it takes place behind closed doors, perhaps because the power and pain and mess and beauty are simply too much, too raw and revealing, for us to take in full view. Behind closed doors, we labor to bring children into the world. Behind closed doors, we labor to keep them clean and fed and healthy. Behind closed doors, we labor to teach them and love them and send them forth into the world. Without the work done behind closed doors – the birthing and the rocking, the soothing and the teaching, the washing and the feeding, the scolding and the loving – none of us would be here. The work we do behind closed doors is dirty. It is draining. It is not always dignified. But it is – in the words of my own wise mother – worthy work. Even if the world does not prize it as such, even as the moment’s demands drain every dredge of delight, even when the pain outweighs the promise, it is worthy. And we need to name it, honor it and share its stories. Because it is holy work, too: the work of creating and sustaining, blessing and growing, caring and comforting. It is the reflection of God’s own work done in silence, in quiet, in darkness. This was so very beautiful! Thank you for your wisdom! And though I probably sound crazy, I love the birthing experience (the actual delivery!) though I never in a million years would have thought that before I brought two lives into the world! Really, really, beautiful and so, so true. Wow, did I really, really, REALLY need to read this tonight as I sit here counting down the hours until I go into labor with Baby B. Because it is our 1st time, I don’t know what to expect – beyond the obvious. I am talking more about the emotions, what I will be capable of doing, what I will not be able to do, etc. Thank you so much for your beautiful thoughts!!! AMEN! (imagine me yelling that in a very loud voice). Love it! For my daughter-in-law that is laboring now, that she might feel the calming Jesus. At this point please grant her rest and let her know that in God’s grace that she will deliver a child of God. Help her to get through this time of intense labor and delivery. I ask Mary to intercede and be with Lauren through all of this.